Because dudes struggle with parched strands, too. Just because dudes don't typically subject their strands to extreme heat and styling tools, doesn't mean they're immune to dry hair. 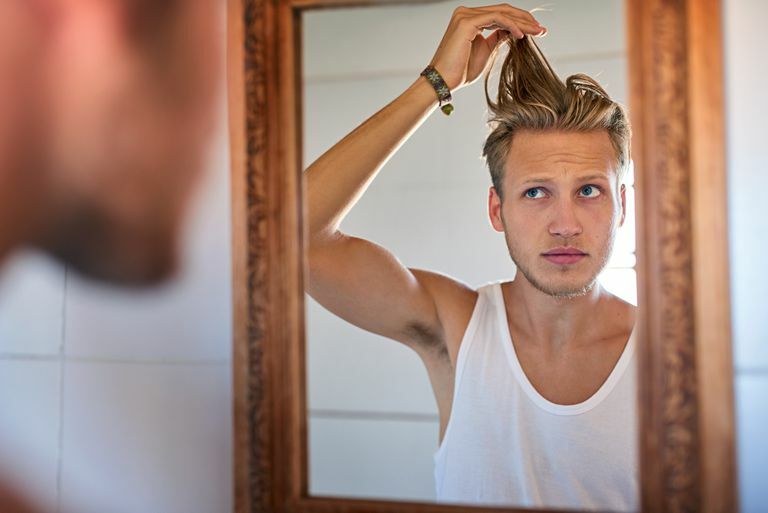 Excessive shampooing in hot water, alcohol-based styling products, and frequent sun exposure, for instance, are just a few factors that can lead to parched locks in men. Often times, though, the fix can be as simple as switching up your shampoo routine or cooling it on a certain product or hot tool. So guys, if your hair has been feeling dry, don't fret because it's 100% fixable. Follow the tips below for rehydrated hair in no time. 1. Shampoo less in cooler water. For most guys, shampooing daily shouldn't be an issue, but if your hair is dry or brittle—or both—you may want to try switching to an every other day schedule. Additionally, when you do shampoo, stick to lukewarm water only, as hot water can be too harsh and damaging for the hair. This also helps prevent scrubbing away too much of your hair's natural oils, which are what makes your strands look shiny and moisturized. If you feel like your hair needs a daily wash, try rinsing with just water or an apple cider vinegar solution instead. You can read more about the latter method's benefits in this handy guide. 2. Try a new shampoo or conditioner. It's been said that using the same shampoo and conditioner for too long a time can sometimes make the hair immune to its benefits, so swapping in a new kind every three or four months is a good game plan if you want to avoid the aforementioned issue. You'll also want to look for shampoo and conditioners labeled as "moisturizing," "hydrating," and "nourishing," as these will cater to your dry hair needs. Another tip: Don't forget to deep condition, as these treatments can seriously help save your thirsty strands—even if you just do it once a week. Simply leave the formula on while you wash your body and rinse for instantly softer, shinier hair. One of the easiest ways to keep hair in good condition is to steer clear of products packed with alcohol. But, believe it or not, not all types of alcohol are actually bad for your hair. In fact, certain ones known as "fatty alcohols" can help to hold moisture in the hair. These include benzyl alcohol, cetyl alcohol, stearyl alcohol, lauryl alcohol, cetearyl alcohol, behenyl alcohol, and myristyl alcohol. On the other hand, these are the ones you should avoid at all costs: ethanol, SD alcohol, alcohol denat, SD alcohol 40, propanol, isopropyl alcohol, and propyl alcohol. When in doubt, read labels and look for natural products with a variety of hair-nourishing oils. 4. Switch up your styling technique. Another super simple way to get hair looking shinier is to style using a boar-bristle or nylon brush, both of which have bristles that are extremely close together. Doing this will help to distribute the oils evenly down the hair shaft, while also stimulating the scalp, too. 5. Change your drying routine. If your hair has been feeling parched and lacks luster, you should always aim to let your hair air-dry rather than using a blow-dryer, as this will only dry the hair out even more. It's also a good idea to blot the hair with a towel or old cotton shirt because rubbing with a towel can cause dry, brittle hair to break off. Once the hair is dry, you can add your favorite alcohol-free styling product and style as usual. And, if you must use a blow-dryer, make sure to apply a thermal styling spray first to help protect the hair and use a cool or low-heat setting on the dryer. Following the tips above—especially those concerning shampoo, conditioner, and styling products—should help correct your dry hair dilemma, but if you're still having problems, consult your barber or go-to hairstylist for more guidance.